Renaissance Stone Care & Waterproofing delivers award-winning quality service with professional results throughout the Bay Area. Renaissance Stone Care & Waterproofing has been providing vital waterproofing services to many of the Bay Area’s most respected and successful builders of custom homes, residential communities, and commercial developments since 1990. We have earned a reputation for quality work and excellent customer service primarily because of our experienced, knowledgeable and highly trained staff and crew. In addition, we use high-quality materials which are installed per manufacturer specifications. We also utilize rigorous training programs for our applicators, adhere to builder’s schedules, and stand behind our work. Customers who choose Renaissance Stone Care & Waterproofing can be confident their property will receive the best and most appropriate waterproofing products available, and that they are applied by professionally trained applicators who adhere to the industry’s highest standards. The experts at Renaissance Stone Care & Waterproofing are well versed in the latest industry technology and architectural trends. Architects and designers today are choosing stone to enhance the beauty and value of homes and businesses. The staff and crew of Renaissance Stone Care & Waterproofing are adept at the correct methods of maintaining each specific type of stone such as Travertine, Marble, Granite, Limestone, Slate or Terrazzo. Effective preservation not only reduces scratching and staining, it also enhances the beauty of the marble while imparting a more slip-and stain-resistant finish to new or existing stone installations. The staff and crew at Renaissance Stone Care & Waterproofing also offer effective restoration stone care services to help customers reclaim their investment in the beauty of precious dimensional stone. Restoration is the healing process that includes stripping away old wax and chemicals, repairing cracks and grouting, refinishing the stone to an even surface, removing scratches, stains, chips and pockmarks. And finally, polishing to achieve the fresh look of a factory finish. Fully licensed and locally-owned, we earn our reputation one satisfied customer at a time. Renaissance Stone Care & Waterproofing’s internal systems and procedures have earned prestigious National Housing Quality (NHQ) Certification from the National Association of Home Builders (NAHB) Research Center. This NHQ Certified Trade Contractor program focuses on the construction industry with particular emphasis on doing things right the first time. To achieve certification, contractors must develop, document, implement, and maintain a quality management system that enables them to consistently meet code and regulatory requirements, building specifications, and homeowner expectations. Customers who work with NHQ Certified Trade Contractors are confident of the level of professionalism and quality of workmanship they will receive. Earning certification and displaying the NHQ Certified Trade Contractor program’s seal demonstrates a company’s ongoing and proactive commitment to quality and continuous improvement. The NAHB Research Center, a wholly-owned subsidiary of the National Association of Home Builders (NAHB), offers this certification program and provides independent, third -party evaluation of participating contractors. 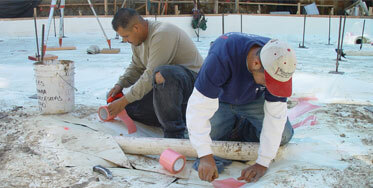 For more information on the NHQ Certified Trade Contractor program, visit www.nahbrc.org. Renaissance Stone Care & Waterproofing is the first waterproofing company in the United States to earn this recognition and they are still the only waterproofing company in California to have such a distinction. Certified annually, this assures customers that Renaissance Stone Care & Waterproofing strives to "do it right the first time, every time."